National Flag Adoption Day:- The National Flag of India has great importance in every Indian people’s heart as it denotes and represents our country as well as provided our country and all the people living in it, freedom from the British rule in 1947. 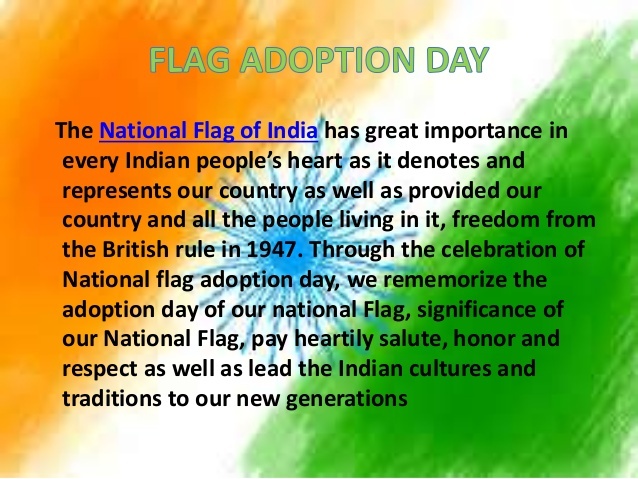 Through the celebration of National flag adoption day, we rememorize the adoption day of our national Flag, significance of our National Flag, pay heartily salute, honor and respect as well as lead the Indian cultures and traditions to our new generations. 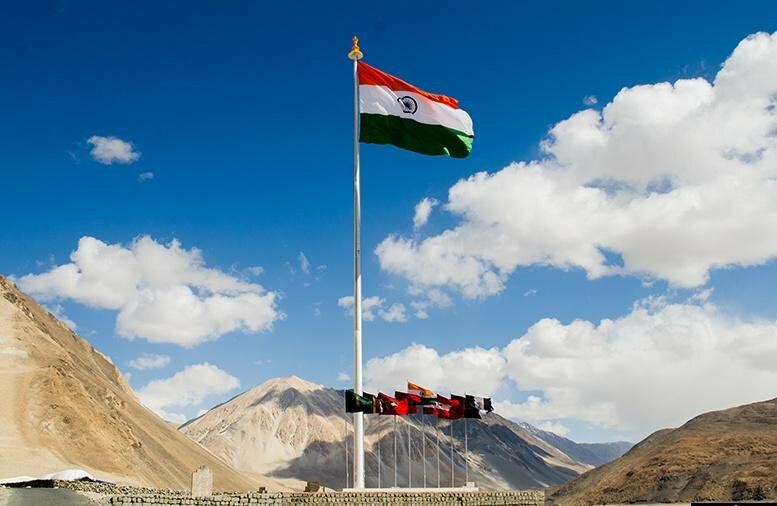 The Indian National Flag, designed by Pingali Venkayya, was first adopted by the Indian Constitution Assembly in a meeting on 22nd of July in the year 1947 that’s why it is being celebrated every year since 1947 all over the India by the title “Indian National Flag Adoption Day” on 22nd of July. The present form of the national flag came into power when it was officially declared as an “official flag of the Dominion of India” in the meeting of Constitution Assembly. The tricolor of the national flag means tiranga was decided and described in the Indian Flag Code as top color saffron (representing courage and sacrifice), bottom color green (representing prosperity) and middle color white (representing peace, truth and purity) having Ashoka Chakra of navy blue color (representing laws of Dharma means righteousness) with 24 spokes in the center. Indian national flag is based on Swaraj flag made up of the hand weaved cotton cloth by the Mahatma Gandhi. The flag manufacturing right is given to the “Khadi Development and Village Industries Commission” and “Karnataka Khadi Gramodyoga Samyukta Sangha” from which flag is allocated to other regions. In order to precede the Indian Independence Movement during British rule in 19th century, variety of flags were designed however a single Indian flag (having western heraldic standards design) was first led by British rulers after 1857revolution. During 1905, the partition of Bengal resulted in the formation of new Indian flag representing the multitude of races and castes of country. During the Swadeshi movement the tricolour Vande Mataram flag (having eight white lotuses in top green field, meddle yellow written Vande Mataram in Hindi and bottom red having a sun and a crescent) was created against British rule. It was first launched in the Calcutta. Sister Nivedita (a Hindu reformist) had proposed for another flag having thunderbolt in centre with Vande Mataram slogan and 108 oil lamps at border which was then presented to the meeting of Indian National Congress in 1906. Whereas, another 30 different designs of flag was proposed by the Pingali Venkayya in 1916. Annie Besant and Bal Gangadhar Tilak too adopted new flag in the same year as a Home Rule Movement. Other flag design (having white top, spinning charkha in the center in the middle red and lower green banner) was initiated by the Mohandas Karamchand Gandhi in April 1921. Swaraj flag with spinning wheel (designed by the Venkayya), was used commemorate the Jallianwala Bagh massacre on 13th of April in 1923. The Constituent Assembly was established in India before the independence. In a meeting at Constituent Assembly in the presence of Rajendra Prasad, Maulana Abul Kalam Azad, C. Rajagopalachari, B.R. Ambedkar, K. M. Munshi, Sarojini Naidu and other members on 23rd of June in 1947, a flag was selected for independent India. 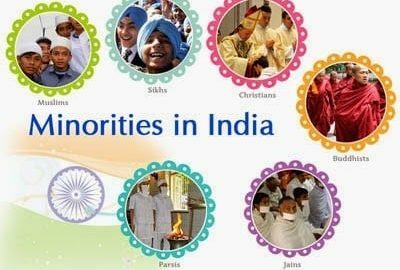 According to the committee recommendation, the flag of Indian National Congress was decided to be adopted as Indian National Flag on 14th of July in 1947 by replacing the spinning wheel with Ashoka Chakra to denote dharma and law. Then it was adopted on 22nd of July in 1947 at Constituent Assembly after the proposal of Nehru for real flag (having horizontal tricolor upper saffron, middle white with Ashoka Chakra of blue navy color and lower dark green of equal proportions). Indian national flag adoption day is celebrated to commemorate the adoption of tricolor Indian National Flag on 22nd of July. Tricolor of the Indian national flag was adopted to represent the true meaning of patriotism as well as spreading true essence and energy among the Indian people especially youths and future generations.